Liqhobong is a small diamond mine in the Maluti mountains of Lesotho, 2000m high and around 150 km NW of the capital Maseru. Around 60 people, who spend most of their time working in diamond mining operations, man it. Most of them worked as migrant workers in South African mines, were dismissed during the mining crisis of the 1980’s and went back into their homeland. Most of these diamond miners have families in other parts of the country that are dependent on the proceeds of the diamond cooperative. This group, mainly women, has been working at Liqhobong for around twenty years and most of its members are nearing retirement age. The desire of the group has been to retire with dignity and with this goal in mind, they attempted to extricate themselves from the influence of the DeBeers cartel. The reason for the desire to cut off the relationship with the cartel is that they were typically receiving $20 per carat for their rough diamonds; enough to survive on, but not nearly compensatory in relation to the ultimate value of the gemstones. The conditions at the camp are typical of an African mining community; that is, poor housing, no electricity, little clean water and marginal housing and sanitary conditions. The government does, however, provide an armed guard in the village. The mine produces fancy colored diamonds, although many of them are small. Canary yellow, blue and pink have been seen and cut from this source, along with traditional white diamonds. Mining is accomplished at Liqhobong with the cooperation of the government. Once a year, an earth moving machine is sent up the mountain to the mine, a year’s supply of kimberlite is removed from the main shaft and heaped on the mountainside. Exposure to the elements breaks down the kimberlite and eliminates the need for rock crushing equipment. 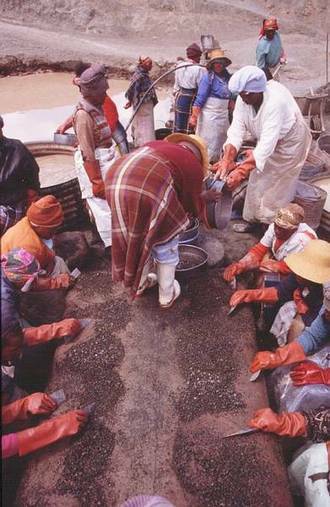 The weathered kimberlite is sluiced and the stones concentrated by sieving. Women and men then pick the rough diamonds from the sifting pans. The diamonds are then sorted into parcels and sent to the auction in Maseru, accompanied by members of the coop. Buyers may view the parcels and enter bids on those which interest them. They are notified of the results within several hours. There is an export office at the ministry of mines, but it does not have frequent visitors who wish to legally export diamonds. The export tax is 15% of the purchased price of the stones. A Fair Trade agreement with the miners was negotiated which included, among other criteria, a second, value-added payment for the stones, to be paid upon sale of the gems. It is to be 15% of the clear profit. Diamantschürferin in der Liqhobong Diamond Cooperative, Drakensberge, Lesotho, südl. Afrika. Saphirabbau in engen Gängen in Madagaskar. Eine von vielen Frauen, die in Madagaskar teilweise auch zusammen mit ihren Kindern Farbsteine schleifen. In dieser großen, schon seit Jahrzehnten betriebenen industriellen Goldmine in den Bergen Rumäniens ereignete sich Anfang 2001 nach starken Regenfällen ein großer Dammbruch des zyanidhaltigen Schlammrückhaltebecken, in denen der Abfall der Goldproduktion gesammelt wird, und verseuchte die gesamte nachfolgende Donauregion von Ungarn bis zur Mündung des Flusses in das schwarze Meer mit tödlichem Zyanid.